From the long-standing ensemble of one of modern saxophone's most respected, individualistic, and free-ranging voices, David Liebman's eminently listenable tribute to one of the most beloved and versatile musical roots of jazz and rock: the blues. Features Lieb on tenor and soprano saxes (playing like you may never have heard him!) and Vic Juris on electric and acoustic guitars, running the blues gamut from Memphis-style shuffles to Kind of Blue-like ethereality to Coltrane-like modal burn to Eddie Harris-like funk. "The first real music that I got into was '50s rock and roll," recalls Lieb, listing "Hound Dog" and "Rock around the Clock" as memorable examples of the era's R&B-based pop music culture and owing his first feeling for the tenor sax to tunes like Duane Eddy's "Rebel Rouser" and the Champs' "Tequila." "I used to listen to Martin Block's ‘Make-Believe Ballroom,' listing my own ‘top 25 of the week' while collecting 45 singles," Lieb continues. "That was really where I first heard music, so in some ways making this blues record is full circle for me." Buy Blues All Ways now at the OmniTone store. 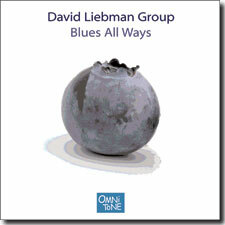 All compositions by David Liebman, Liebstone Music (BMI), except as noted. Recorded on 5 April 2005 at Systems II in Brooklyn, New York.